Zorra asked us to bake flat breads for the Bread Baking Day. When my boyfriends parents gave us a lot of beautful mangold from their garden, I had the idea to fill Pide with them. When I checked recipes for the dough I realized that they all contain much or very much oil. So When I put my recipe together, I opted for a lot oil, some milk for an extra soft dough and a spoonful of unfed sourdough for a better flavour (the pide were a quick decision for dinner with no time for preferments). Oil, on one hand, makes the dough soft and easy to handle, but on the other hand building up the gluten network is inhibited. So the dough needs to be kneaded intensively on slow speed. But after about 15 min you will get the perfect dough, which can be formed without any sticking. 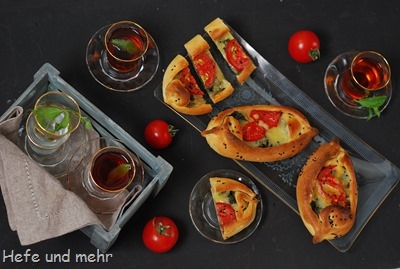 The pide is delicious warm and cold (perfekt for lunch-at-work) and can be filled with other delicious thinks like spinach as well! Zorras Bread Baking Day exists since 2007 and I feel honoured that I’m allowed to host it now for the third time. After we baked “sweet bread” (BBD #22) back in 2009 and “overnight recipes”(BBD#54) one and a half year ago I decided this time for the theme “Ancient”. But what do I mean with “Ancient”? I would like to focus on old techniques in bread baking (e.g. wood fired oven), traditional recipes (maybe an old family recipe?) and old grain species like Emmer, Khorasan or Einkorn or heritage wheat or rye like red fife wheat, or Johannisroggen for example. You have not to fulfil all three criteria, one of them is enough. And I would love if you try to bake the bread with sourdough, but this is optional! I baked already a lot of french breads: Brioche, Brioche Tropézienne, Baguette in all Variations, Pain d’Epi, Pain de Mie, Croissants and au chocolate, Pain Bordelaise únd Pain aux Levain aux grains mélangés e noisettes. Did I forget something? Ah, yes, there was also the Pain de Beaucaire. 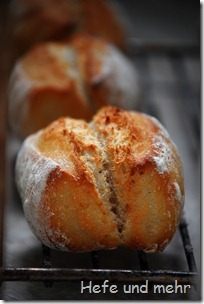 A great bread, which method for forming the loaves fascinated me already three years ago. It was time to dust off the recipe and bake it again. This time I used an old-bread-preferment and reduce the size of the bread to produce rolls instead. This idea I got from Lutz, who unintentionally baked the Pain de Beaucaire as rolls, an idea I liked already when I read his blog entry two years ago. And like the last time, forming the bread was an easy thing to do, and seeing the great ovenspring in the oven let me already hope for the best. When I pull the rolls out of the oven their crust sang already its crackling song while cooling down, promising me an airy crumb under the crisp crust. An really, when I cut one of the rolls, I was very happy with the crumb I see, open but not to open, perfect for breakfast. 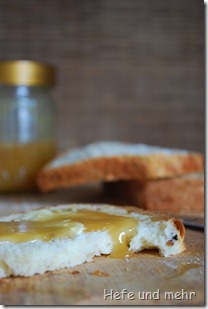 I’m happy, that Cinzia from Cindystarblog choose the theme French Bread for Bread Baking Day! I’m not a huge beer fan. Seldomly, maybe one or twice a year, I like to have a little bit beer. That happens normally when we are in Belgium and then I prefer some beer from a small (family-) brewery like Brugse Zot. I don’t like Kölsch, a beer that is typical for the region I’m living, and the same is true for Pils, too. That is not the best starting point to bake a Bread with Beer for the 5. Birthday of Bread Baking Day. I tried it anyway, but was not convinced of the taste of the bread I baked. 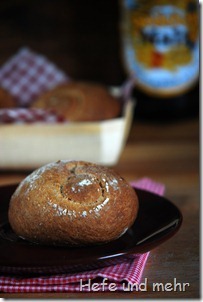 And so I decided to cheat a little bit and bake some rolls made with malt beer. I used a local brand “Golden Malz” which is produced in a brewery only 9 km from where I live. It is a real piece of home. Pudding pretzels or Pudding pastry are one of the best pastries you can buy in the bakery. They are so delicious that I even ignore that the boyfriend calls them “Eiterbrille” (that means pus-filled goggles). I know this term for them is common in the Rhineland but I don’t like it. The pudding pretzels you can buy are made with danish pastry dough but when I made them last weekend I decided to use a simple challah dough instead. That saves some time and a lot of calories! The Theme of this month’ bread baking day is “Bread with Curd”. 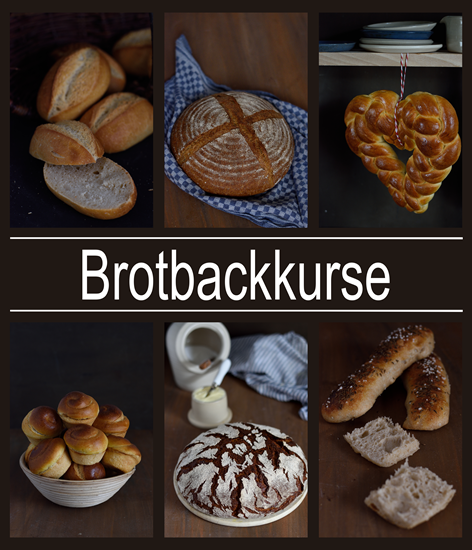 You can find bread and Pastry made with curd very often on our table and I bake already two recipes for BBD with curd. Because I like sweet buns ( they are called “Weckchen” in cologne”) very much I decided to bake some “Quark-Weckchen” (Curd buns) for bread baking day. 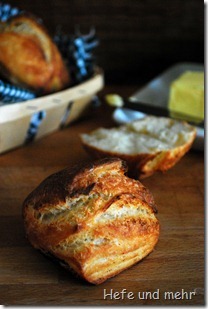 Curd makes bread moist and adds a subtle tartness to the dough. To prevent a to sour dough I decided to use a poolish as preferment. I kneaded the dough very long to make the crumb fluffy and regular and because of butter and egg the crust stays soft. I do not use so much sugar for this buns, so if you like a more sweet bun like Pani di cena you should increase the amount of sugar. 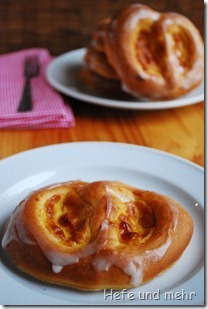 The buns are everything that I love for a quiet breakfast: Soft, slightly sweet and slightly sour. Prefect for sunday mornings! Like Lutz I like to vary the basic recipe of the yoghurt sesame rolls very much. The Hazelnuts rolls were my first variation and a very delicious one! When my mum asked me if she could bake the yoghurt sesame rolls with curd instead of yoghurt because she like the more sour taste of curd. I told her directly “What a great Idea” and go to the kitchen to create a recipe with curd. Like in the recipe for this no knead wheat bread I added a poolish and fold the dough three times before fermenting over night. 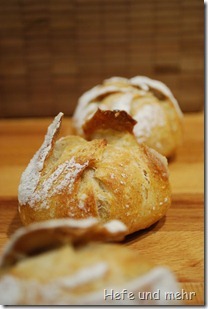 To fold the dough is a easy method to develop the gluten network which creates a nice crumb without kneading. Because curd contains not so much liquid as yoghurt I added some milk to the recipe. 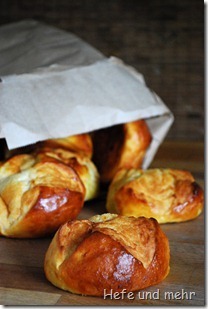 The curd rolls taste aromatic and slightly sour and the crumb is soft and moist. The crust is nice but not as crisp as the crust of rolls just made with water, flour and yeast. Last Weekend I saw a Mandelstuten – a sweet bread with almonds – at our local baker. But while I love to eat breakfast in the Café that belongs to the bakery, I nearly never buy bread there. I prefer to bake it at my own. 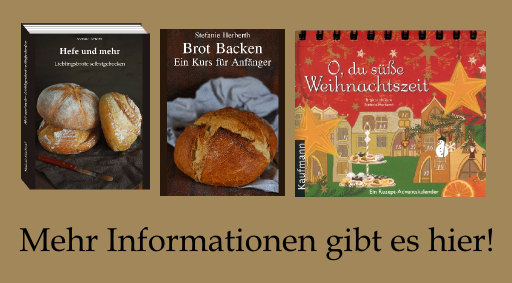 But I make for my own: Bake Mandelstuten! And when I read the anouncement for 31. Bread baking day it felt as if Zorra from 1x umrühren bitte read my mind. The Theme she choose for the 3rd anniversary is Bread with nuts. Isn’t this perfect? When I tried to decide which dough I should use as a basic for the Mandelstuten Paules post reminds me of the Hokkaido Milk Bread. This recipe use cream instead of oil or butter and I liked the idea to create a dough similar to the Milk bread. I included a preferment and add more cream to the dough and removed milk powder from the formula. And because the Mandelstuten at the bakery was braided and then baked in a bread pan so I braided my bread, too. Bread Baking Day’s Topic is “Breads with a Twist” and its hostess is Natashya form Living in the kitchen with puppies. While still thinking about a recipe I saw a show on TV where they explained how to make “Burger pretzels”. This is a local speciality which is selled mostly around the castle Schloss Burg and which is part of the “Bergische Kaffeetafel”. This is a tradition similar to afternoon tea in Greatbritain. The “Bergische Kaffeetafel” is served with Coffee from the Dröppelminna, the dark rye Schwarzbrot, sweet white bread called Stuten or Platz, heartshaped waffles, rice pudding with sugar and cinnamon, Burger pretzels, curd, sugar beet molasses, cheese and bacon. 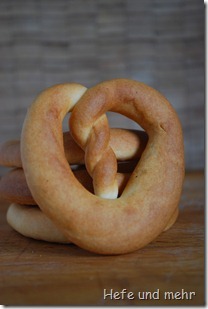 This preztels have not the typical form of a pretzel we know from South Germany but its ends are twisted for four times.